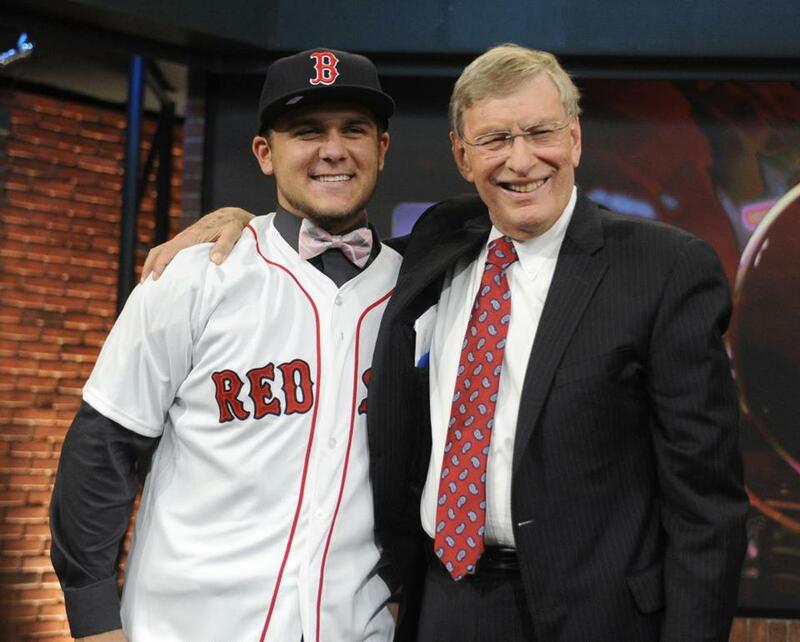 Commissioner Bud Selig, right, poses with shortstop Michael Chavis at the 2014 MLB baseball draft Thursday. Chavis was selected by the Red Sox with the 26th pick in the first round. The Red Sox selected Michael Chavis, a high school infielder from Georgia, with their first selection (No. 26 overall) in the amateur draft. Chavis played shortstop at Sprayberry High in Marietta, Ga., but projects to play third base or second base. Chavis hit .557 as a senior with 13 home runs. Chavis attended two workouts the Red Sox held in Georgia and suspected they would draft him. Chavis has committed to Clemson. But he said he was open to the idea of signing with the Sox. Two Massachusetts native pitchers were chosen in the first round. “Fairly comfortable saying that I am,” he said. Chavis attended the draft in New Jersey sporting a bowtie and showed plenty of personality during a conference call with reporters. “A little flashy, kind of classy. Thought I’d bring it out,” Chavis said of his distinctive neckwear. Chavis was considered one of the best high school hitters in the draft. The 5-foot-10-inch righthanded hitter has good power and speed. With the 33rd overall pick, a selection gained as compensation for free agent Jacoby Ellsbury signing with the Yankees, the Sox selected Texas high school righthander Michael Kopech. The 6-4 Kopech, who is from Mount Pleasant, Texas, has hit 98 miles per hour with his fastball and has a good curveball. His mechanics need work, although he is a good athlete. In the second round, 67th overall, the Red Sox took Sam Travis, a 6-foot, 210-pound first baseman from Indiana. He hit .347 with a .991 OPS as a junior with 12 homers and 58 RBIs over 59 games for the Hoosiers.